I met Ei Arakawa at the opening for Skulpturprojekte Muenster in 2017 for the first time. I already was fascinated by the work I saw in the Gallery Meyer Kainer in Vienna before that. He cooked together with some artists a dinner at a friend’s house, where I stayed to visit the opening of this exhibition. It was fabulous, wonderful food from all over the world, from Japan, Georgia, Italy… lots of wine, it was fun. Ei is an artist who always works in dialog and thus in teams. He works with other artists, musicians, composers, performers etc. Ei’s class 2018 performed several times publicly, f.e. in the Kunstverein at an opening. The performances were funny, well performed, super interesting stories. All in all fun for everybody, the performers and the public alike. 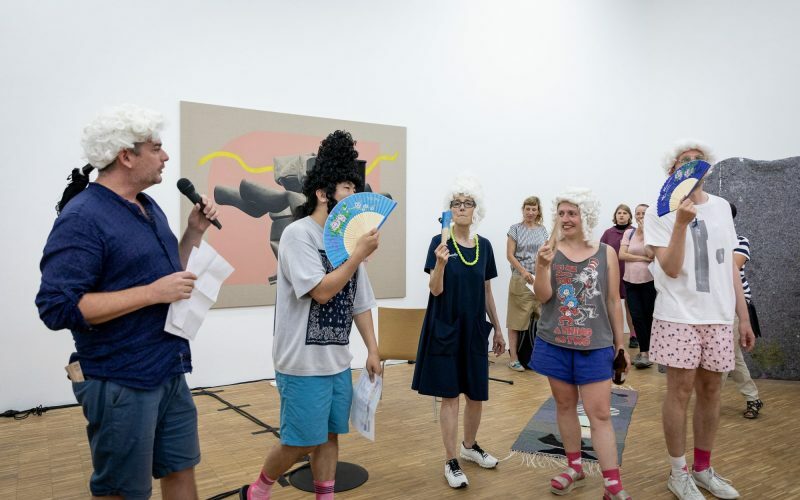 The photo above shows from left to right: Seamus Kealy, the director and curator of the Salzburg Kunstverein at the opening 2018, myself, Caroline Achaintre and Ei’s two co-teachers Noële Ody and Christian Naujoks.